In some of the poorest parts of the world, large portions of the economy depend on goods and services provided by natural capital, but ecosystem services in those areas are often severely degraded. Conservation and restoration efforts dedicated to these landscapes would dramatically improve people’s lives while also making important contributions to biodiversity conservation. Global development and conservation agendas are increasingly aligned to seize this opportunity, as reflected in the language of both the Convention on Biological Diversity and the post-2015 Sustainable Development Goals. This interdisciplinary perspective however, brings significant challenges regarding how decisions regarding trade-offs and synergies around development opportunities are made, and on how to measure and monitor the impact of development interventions. "Making Ecosystems Count in the SDGs" is an NCEAS-SNAP Working Group focused on developing natural resource and ecosystem service-based indicators for monitoring country-scale progress towards Sustainable Development Goals. We are building indicators that are grounded in ecosystem sciences, that include novel evaluation measures for natural capital and ecosystem services, and that are formulated to be relevant to policy makers who must make difficult decisions about large-scale development and its impact on present and future livelihoods. To this end we have created the "Mapping Ecosystem Services to Human wellbeing (MESH) toolkit - an interactive platform to generate land use scenarios, evaluate and map ecosystem service tradeoffs, and view the results impact on the SDGs. A freely available version of the software will be available for download from that Natural Capital Project upon its release later this year (2015-2016). The most biodiverse places on earth are also centres of high rates of poverty and population growth. The relationship between poverty and biodiversity is at the center of emerging academic and policy debate, yet little is understood of the micro-economic drivers which indirectly influence biodiversity through land-management. Millions of forest dwelling peasants throughout the tropics depend on forests and their regenerative capacity to support forms of shifting cultivation. My research looks at intra-community differences in household wealth, as measured by landholdings, in an agroforestry-based economy and its relationship to land management and biodiversity conservation.Agroforestry is increasingly promoted as a win-win strategy for wildlife-friendly and sustainable farming. 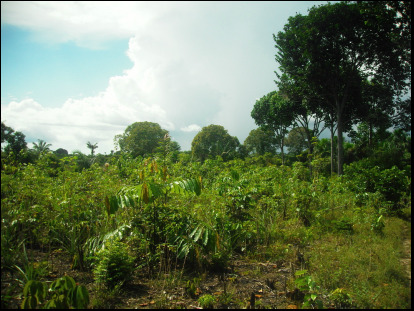 Yet, recent work in the Amazon has shown that the frequency of swidden cycles is linked to household landholdings (wealth) which may impact how effective forest fallows are in maintaining biodiversity and replenishing soil resources. Our study examines the impact of repeated cultivation cycles of varying length on soil fertility and tree biodiversity at site and landscape levels. We use historic management practices from a village in Amazonian Peru, alongside ecological and GIS data of landholdings, to look at patterns of forest biodiversity and soil degradation in forest fallows across the landscape. Tajikistan has lost over 75% of their remaining forest cover since independence in 1991 and has experience increasing energy scarcity, particularly in rural areas. With most communities cut off from the central power grid due to remote locations and rugged terrain, household energy needs are primarily met through burning of fuel wood and livestock paddy-cakes. In light of increasing energy demands due to tourism and depletion of local fuel wood resources, at MSDSP I worked to develop local technologies to assist households to meet their energy needs and reduce their dependence on scarce forest resources. A pilot project was launched to build and test locally constructed solar hot water heaters and various models of solar panels installed into households for reliability, cost and community acceptance. Jezev is a unique community in the Pamir mountains with one of the few remaining intact forest reserves and an increasing tourism economy. Meeting tourists needs for showers and hot water was expected to have a negative impact on forest resources over the long term. Six system solar hot water heater designs, including both batch and thermo-syphon systems, were tested in the field with tourist 'homestays' in conjunction with outdoor shower stalls. Through feedback from community members it was batch system which heat small volumes of water quickly for periodic use throughout the day were perfered. Thermo-syphon systems which gradually heat large quantities of water over the course of the day for use in the evening did not fit daily routines. Systems with large pipe volumes operate best for batch designs and pipes oriented vertically heated water most quickly. In addition community behaviours and irrigation systems affect the maintenance and suitability of systems (i.e. the tanks were often left empty of water leading to rusting) suggesting that further learning would be required for successful, long-term adoption of these technologies. Sediment and nutrient loading in freshwater systems are leading causes of aquatic habitat degradation in North America. The impacts of fine-sediment and nutrient additions on the growth and survival of Bufo boreas tadpoles and emergent toadlets was investigated in mesocosm and exclosure experiments. Mesocosm tanks received weekly pulses of fine, organic-rich (8% -9%) sediments to create initial concentrations of 0, 130 and 260 mg/L of sediment and bi-weekly additions of nutrients (N-160 μg/L, P-10 μg/L) in a factorial design. Within mesocosms, tadpole exclosures allowed for quantification of tadpole grazing pressure on periphyton biomass, chlorophyll a and sediment deposition. Tadpoles receiving sediment additions experienced slower growth rates and reduced survival to metamorphosis, though no effects of treatment were detected on metamorphic size or timing. Nutrient additions also lowered survival, but had no impact on other measured parameters. Dissections and gut content analysis revealed that tadpoles ingested sediment in large quantities and scanning electron microscopy showed particles were also found in their gill tissues. Together these results suggest that though organic-rich sediments were readily consumed, tadpoles derived little or no net benefit from these materials. Measures from tiles within the exclosures in the mesocosm experiment demonstrated that tadpoles were able to reduce the standing stocks of periphyton by 35-80% and to clear virtually 100% of all deposited sediment from grazing surfaces. Sediment clearing activities via ingestion acted to restructure the benthic abiotic habitat, but at tadpole densities used in the experiment did not have a beneficial effect on underlying periphyton growth. Under natural conditions, such grazing pressure and sediment removal activities could lead to changes in the algal community and consequent shifts in invertebrate grazers. Together, these results highlight a potential role for Bufo boreas tadpoles as ecosystem engineers in temperate pond habitats. Clutch size, total clutch volume and individual egg volumes were compared between and within laying attempts to investigate patterns of female resource allocation and its reproductive costs in the barn swallow, Hirundo rustica erythrogaster. Being a double-brooded species, the production of experimentally induced replacement clutches (via clutch removal) along side natural second clutches allowed inferences to be made regarding the impact of investment level in first clutches on the future reproduction of a female. Inter-clutch comparisons showed that females successfully fledgling a first brood laid smaller second clutches of lower total volume than their first clutches. Conversely, females with truncated investment in first clutches via a clutch removal, laid marginally larger replacement clutches and eggs. Differences in investment level in first clutches by females were not reflected in a deterioration of body condition, as female body condition remained constant between first and re-nest clutches. Intra-clutch egg size comparisons showed that, similar to other open-nesting passerines, barn swallows laid clutches of increasing egg size with laying order. This trend was more pronounced in larger clutches where the final eggs were significantly larger than the mean volume of previous eggs in the clutch. The relative size of the final egg was not related to female body condition or to lay-date. From these comparisons, it was concluded that egg production alone is not exceptionally costly in barn swallows, but that the quantity of energetic investment in initial clutches has carry-over effects on future reproduction, implying an accruing reproductive cost to egg laying, incubation and rearing phases. From patterns in egg size, barn swallows appear to follow a “Brood Survival” strategy in that larger last eggs may compensate for the negative effects of adaptive asynchrony in hatching on last hatched nestlings.